When Fortnite developer Epic Games decided to skip the Google Play Store and asked players to install the newly released Android app from its website instead, the decision made a lot of sense financially. By cutting out Google, Epic could now retain 100 percent of the game’s profits on Android, rather than let Google take its traditional 30 per cent cut for apps hosted on Google Play. However, the decision to sidestep the easiest and most trusted way to download Android apps has also opened up Fortnite fans to getting scammed or exploited. Really, it was only a matter of time until malicious actors tried to take advantage of the situation in order to spread viruses or other harmful software. And according to Wired and security software maker Lookout, it seems that in less than a week after Fortnite’s debut on Android, seven unauthorised sites have already popped up disguised as sources for people to download Fortnite, with each one serving up some sort of malware. So here’s a friendly public service announcement: Stop trying to download Fortnite from weird places. There’s only one place you can go to officially get Fortnite for Android—It’s here: Fortnite.com/android—directly from Epic Games. Anyone who says differently is trying to trick you. 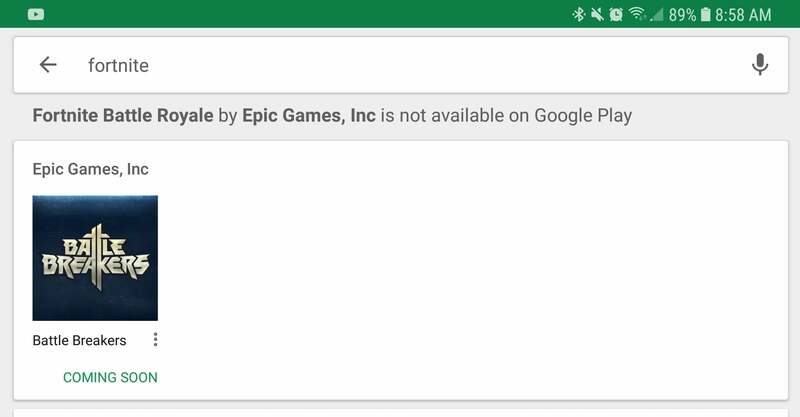 Even Google has a message on the Play Store when you search for Fortnite, explaining that the game isn’t available there. So if you happen to see something on Google that looks like the popular cartoony shooter, don’t touch that app either. Gaming should be a fun way to relax, not a threat to your security, but it’s going to take some common sense to avoid getting hacked. If you need more details on how to download and install Fortnite safely, check out our guide here.